A simply stunning Arts & Crafts mahogany cased mantle clock, with exquisitely designed silvered figural panels depicting "Night" & "Day" and silvered hands/clock face numerals; by the Wolverhampton artist, sculptor & jewellery/metalwork designer, Robert Jackson Emerson FRBS, RBSA (1878-1944). Intertwined monogrammed "RJE" to silvered panels. 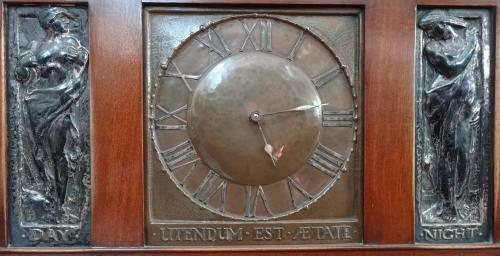 Central copper clock face with the Latin phrase "Utendum Est Etate", loosely translated as "make use of time"; c1910. RJ Emerson`s work is much featured in the Studio magazine at the time and other similar examples of his work are held at the Wolverhampton Museum & Art Gallery. He won several awards in the National Competitions at South Kensington. By 1906 he was working for Collins and Company, a firm of art metalworkers run by William Pick in Princess Road, Leicester. Several examples of his work were shown by them at the Arts and Crafts Exhibition of that year at the Grafton Gallery. They produced a wide range of decorative metalwork including jewellery, door furniture, cabinet fittings and beaten metal or cast plaques for use in domestic or church furnishings. Approx 12.5" wide, 8" high and 5" deep.